212 pages | 11 B/W Illus. Animals are conscious beings that form their own perspective regarding the lifeworlds in which they exist, and according to which they act in relation to their species and other animals. In recent decades a thorough transformation in societal research has taken place, as many groups that were previously perceived as being passive or subjugated objects have become active subjects. This fundamental reassessment, first promoted by feminist and radical studies, has subsequently been followed by spatial and material turns that have brought non-human agency to the fore. In human–animal relations, despite a power imbalance, animals are not mere objects but act as agents. They shape our material world and our encounters with them influence the way we think about the world and ourselves. This book focuses on animal agency and interactions between humans and animals. It explores the reciprocity of human–animal relations and the capacity of animals to act and shape human societies. 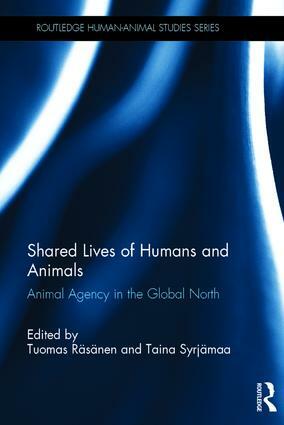 The chapters draw on examples from the Global North to explore how human life in modernity has been and is shaped by the sentience, autonomy, and physicality of various animals, particularly in landscapes where communities and wild animals exist in close proximity. It offers a timely contribution to animal studies, environmental geography, environmental history, and social science and humanities studies of the environment more broadly. Tuomas Räsänen is a postdoctoral researcher at the Department of European and World History at the University of Turku, Finland. His research interests include animal history, environmental history and history of science. He has published several articles concerning the history of marine sciences and politics in the Baltic Sea area and the history of Finnish environmentalism. Taina Syrjämaa is Professor of European and World History at the University of Turku, Finland. She has studied urban history, the history of the exhibition medium, the belief in progress, historical spatiality and diffuse agency. She is currently leading the research project "Animal Agency in Human Society."